The LESCO® story began in 1962, when James Fitzgibbon and Robert Burkhardt founded Lakeshore Equipment & Supply Company in Cleveland, Ohio. 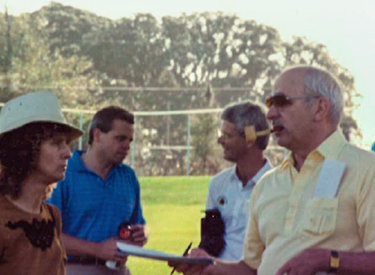 Their mission was to serve the turf needs of golf courses better than anyone else. Starting with only five employees, they recruited former golf course superintendents that had a deep understanding of turf care—who delivered a level of expertise that other distributors couldn’t match. By exhibiting at industry trade shows and adding irrigation to their product lineup, they earned a reputation as a trusted one-stop service provider. In 1965, they launched a quarterly newsletter that spread expert agronomic information nationwide, reaching a circulation of 70,000. After just three years, the foundation of an industry leader was in place. Manufacturing a Bigger, Brighter Future. With a strong reputation to build on, the company began manufacturing its own agronomic products for the golf market in the 1960s. Based on an acronym for Lakeshore Equipment & Supply Company, these products were branded LESCO. After years of producing a core line of quality, reliable products, the brand released its first proprietary fertilizer blend in 1974. This formula would serve as the launching point for remarkable growth over the next decade. LESCO introduced an innovative store-on-wheels distribution model in 1976—a stocked truck that delivered products to courses on demand. Providing convenience and savings for golf courses that normally had to invest in on-site storage became an important differentiator. 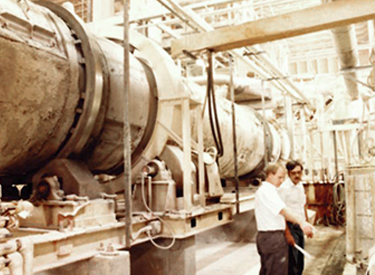 To meet rapidly-growing demand, the company opened a manufacturing plant dedicated to formulating sulphur-coated urea fertilizer in 1978—the first facility of its kind in the nation. This opened the door for the company’s next big breakthrough—PolyPlus slow-release fertilizer. With a growing workforce, LESCO relocated to Rocky River, Ohio in 1980, where operations expanded to include equipment manufacturing. The first new product release was the original 80# LESCO rotary push spreader, paving the way for a long line of trusted equipment products. Continuing its growth-focused mindset, the company officially changed its name to LESCO, Inc., and went public on NASDAQ in 1984. In 1985, the company received its first patent for the Jet-Action Spreader Deflector, the component that differentiated the 80# LESCO rotary push spreader from previous models. That same year, the first LESCO Service Center debuted in Florida—a 5,000 square foot facility with a drive-through for added convenience. In 1987, LESCO was named by Forbes magazine as #66 on the list of Best Small Companies in America. Over the next decade LESCO continued to build out a bigger, stronger line of products based on customer feedback. From greens-grade fertilizer and seed to mowers and irrigation equipment, the company continued to expand its offering and strengthen its reputation as the one-stop-shop for competitively priced, quality turf care products. By 1996, nearly 50% of major golf courses reported using LESCO products. 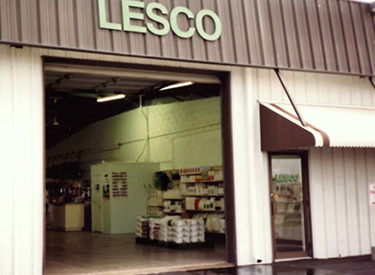 That year, the company introduced the first LESCO Superstore in Pinehurst, North Carolina. In 2007, the LESCO brand was acquired by John Deere Landscapes, which would later become SiteOne Landscape Supply. With this acquisition, they found a partner with a shared focus on expert, customer-centric service. Today, SiteOne carries on LESCO’s tradition of innovating turf care. The company launched a new e-commerce site in 2018, allowing turf professionals to order online and have products delivered to the work site. It also launched a new line of advanced agronomic products in 2019, including carbon-based products and enhanced efficiency fertilizers. But while the blends and bags continue to change, one thing remains constant. Just like in 1962, LESCO is still a brand built on industry expertise that competitors can’t match.